These DIY bath bombs make a wonderful gift for someone special. You could also spend a lovely afternoon making them with someone special! You can use a bath bomb mould for these, however the one in the photo above has been hand rolled, which works just as well and is a bit more fun. Infuse 1 tablespoon of dried rose petals with castor oil (or alternative oil) for a few hours or overnight. Once the dried rose petals have been infused, strain the oil through a garni bag, some muslin or a sieve into a cup and set aside. You may need to squeeze the rose petals to get more of the oil out. Stir all of the dry ingredients together in a glass bowl until mixed through. Add rose infused castor oil, essential oils and vitamin E oil (if using) to the dry ingredients and mix until you have a crumbly mixture that still holds together well. Divide the mixture into 5 equal portions. Gently roll each portion into a ball without pressing too hard. This will take a little patience, but slowly you’ll start to see you ball form and hold together. Once you have 5 balls, roll each of them in the remaining rose petals. You might like to grind the petals down using a mortar and pestle to make the smaller. This will help them stick more easily to the bath bomb. Let the bath bombs set overnight, and let them air dry for another 24 hours after that. Divide your mixture into the moulds and pack down lightly. Press some rose petals into the tops of them for decoration. You might like to grind them down using a mortar and pestle, as mentioned above. Let your DIY bath bombs set overnight in the mould. The following day, gently remove the bath bombs from the mould, and let them air dry for 24 hours. This recipe makes enough for approximately 5 round 100g bath bombs. To use, run a warm bath and drop one in. It should fizz and release a beautiful relaxing aroma. We recommend using 1-2 times a week. Store in a sealed glass jar out of direct sunlight. 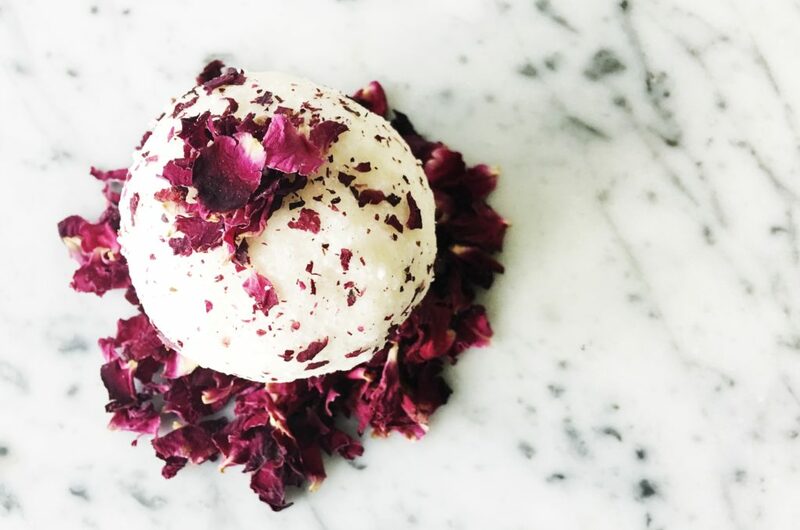 Our DIY bath bombs are extra special as they only use safe, earth friendly ingredients. They do not contain any artificial colours, perfumes, or sodium laureth sulphate like some commercial bath bombs do.